On August 11, 2012, at the age of 70, Bill Bennett implemented an ambitious plan to minimize boating accidents and fatalities in southeast Louisiana. Boater safety education is mandatory for everyone born in the state after 1983, but online programs have made it much easier to get certified. Too easy, according to Bill, who noticed that safe boating practices in our area were suffering from new boaters preparing for the test rather than truly learning the skills. Determined to change this course of events, Bill developed a plan to improve the quality and success of boater safety education. To lure boaters away from their computers, Bill created and promoted a new educational center, free of charge to students. 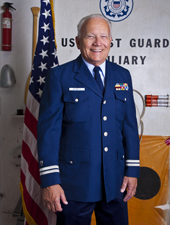 Through his position as commander of Flotilla 42 of the United States Coast Guard Auxiliary, Bill transformed the classroom environment for greater access, with more in-depth learning and better retention of safe boating skills – all accomplished without federal funds. As a longtime boat racer and water enthusiast, Bill appreciates the benefits and efficiency available through modern technology. In practice, however, he has seen the importance of using technology for support, not as a substitute for basic skills and knowledge. For example, a GPS device is a great help in navigation. But without basic skills, such as reading hazard symbols on a map or interpreting visual indicators in the open water, reliance on a GPS can prove fatal. Life experience has shown Bill that when it comes to ourselves and those we love, there are no shortcuts to ensuring safety. Some things in life are worth the time and extra effort to make sure they’re done right – and spreading his message of care and competence on marine vessels is at the top of his list. Bill Bennett … Peoples Health Champion.